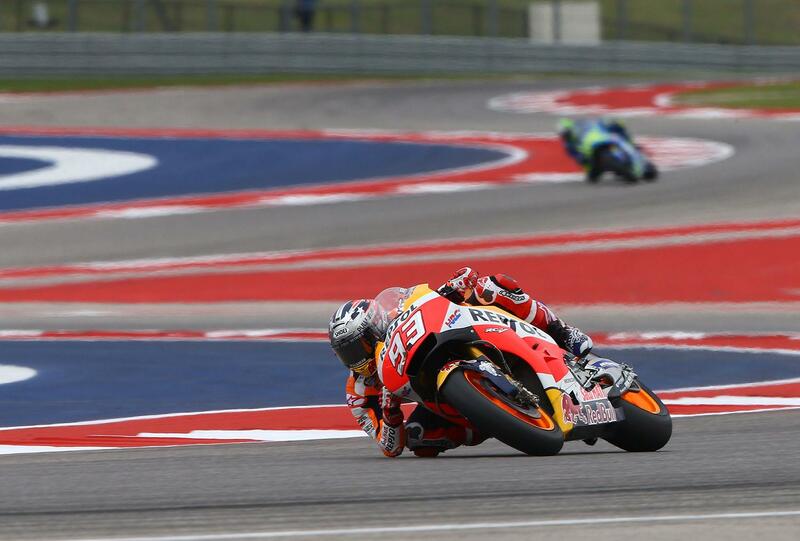 Marc Marquez has taken an outstanding ninth consecutive American Grand Prix – and his fifth at the Circuit of the Americas – in an action packed race that has turned the 2017 MotoGP championship on it’s head after title leader Maverick Viñales crashed out of contention. Dani Pedrosa was the surprise early leader, at the front for most of the race while teammate Marc Marquez sat behind him. But it was an early end to Viñales’ challenge when the Movistar Yamaha rider ran wide and lost the front on only lap two of the race. That left Valentino Rossi flying the flag in third for Yamaha after disposing of rookie Johann Zarco – but he was able to keep his patience at the end to hunt down the Repsol Honda and make his move in the latter stages for second and the world championship lead. Cal Crutchlow had a strong ride into fourth, also hunting down Zarco in the closing stages to give the rookie a still-impressive fifth place ahead of Andrea Dovizioso and Andrea Iannone, while Danilo Petrucci, Jorge Lorenzo and Jack Miller rounded out the top ten. Scott Redding came home in 12th, with Bradley Smith just losing out on a point in 16th on the Red Bull KTM and with Sam Lowes crashing out of points contention at the half way point.